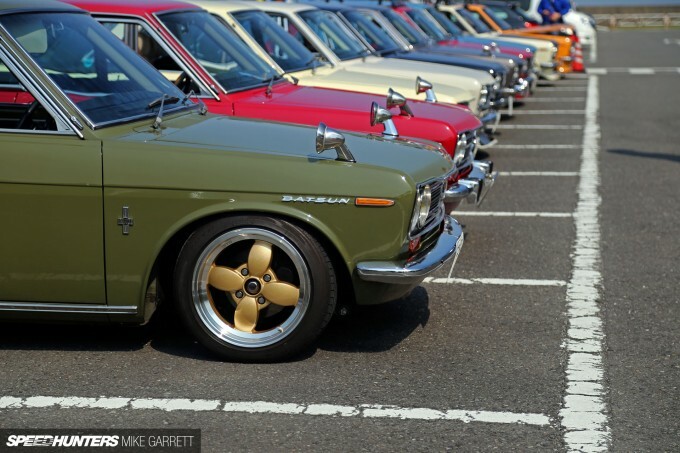 What do you do on the day immediately following one of the greatest car meets ever? You go to another car meet. 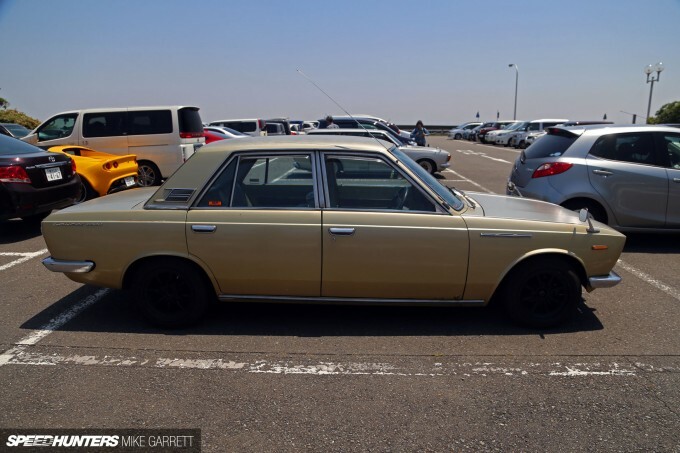 This past Sunday, less than 12 hours after we finished up our cruise night in Minato Mirai 21 I found myself in Yokohama once more for another gathering. 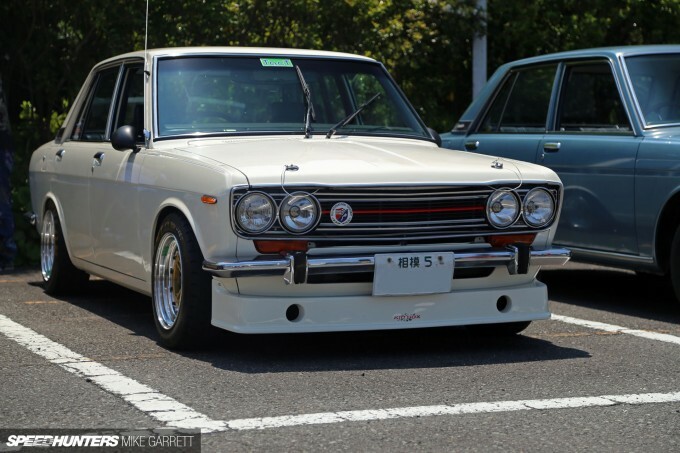 The date was May 10th, and that meant it was time to celebrate 510 Day – Datsun 510 that is. 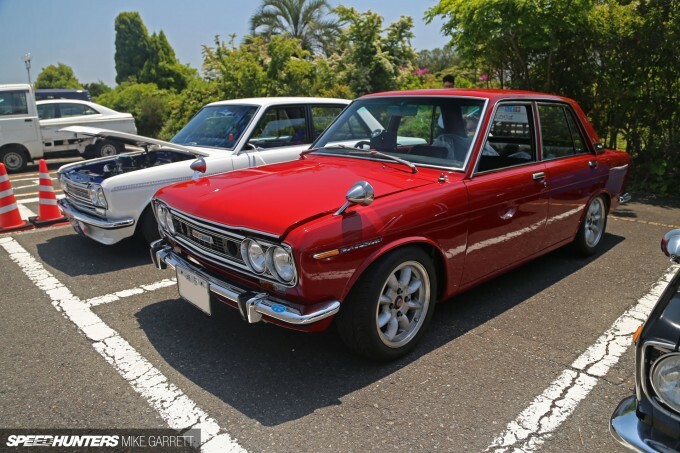 Sure, I was still exhausted from the previous night’s action, but that wasn’t going to stop me from spending an afternoon celebrating this iconic Nissan model. 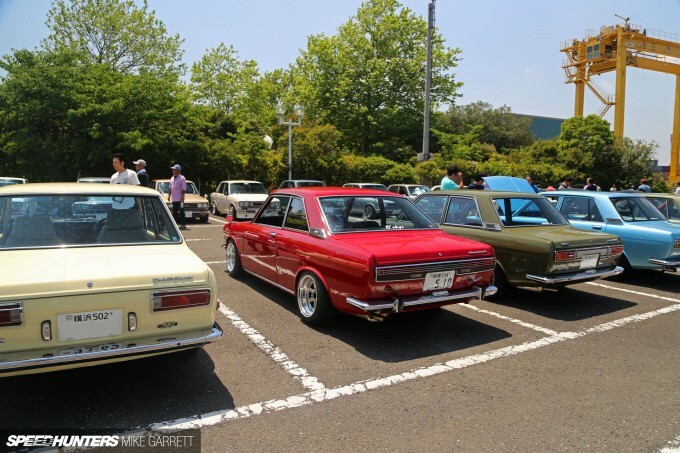 I was actually told about this meet by my friend Tamura-san, a 510 owner who created the event so that Kanto area 510 faithful could get-together to celebrate their favorite car. And he picked a damn cool place to throw a car meet! 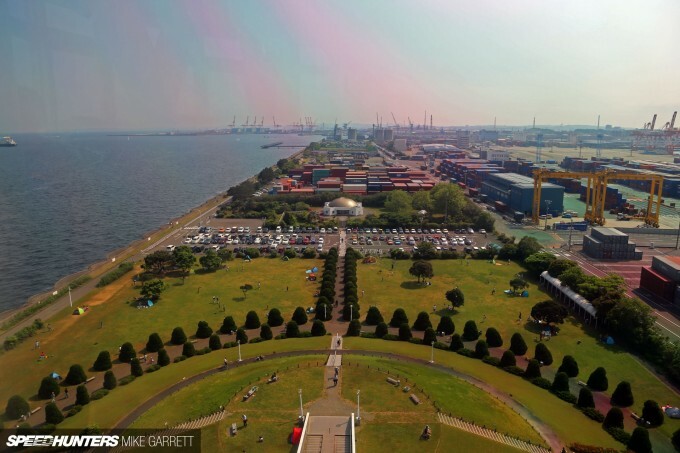 The parking lot at the Yokohama Port Symbol Tower is a spot well known for its easy-going vibe and fantastic views of Tokyo Bay. The weather on 510 Day could not have been better – sunny and warm with a pleasant breeze blowing in off the bay. In other words, perfect conditions for a car meet. With about 40 cars in attendance this wasn’t a gigantic event, but after the craziness of Saturday I was perfectly okay with that. It was a great way to unwind after a long night. 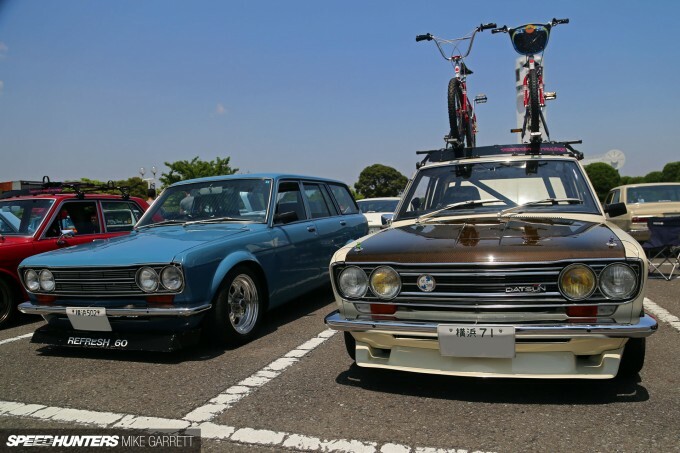 The Datsun 510/Nissan Bluebird occupies an interesting place in Japan’s classic car scene. 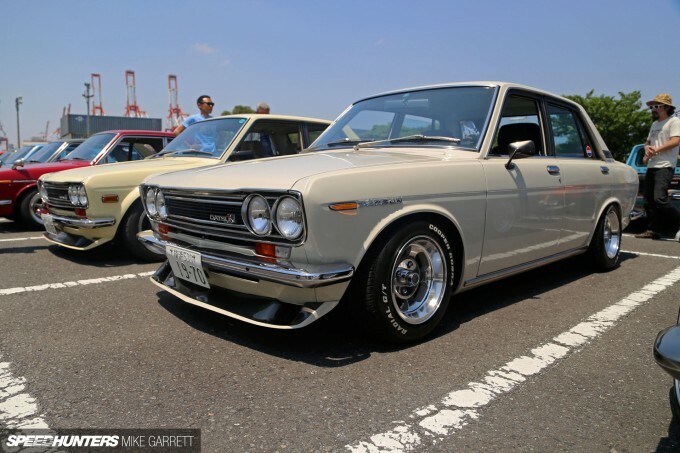 It might not share quite the same legendary reputation of the Skyline GT-R or Fairlady Z, but 510 owners are some of the coolest and most passionate people you’ll find. 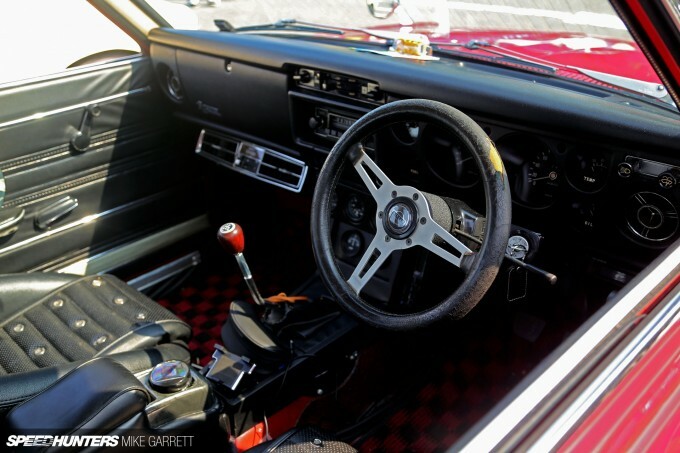 When it comes to customization the 510 is a versatile machine, and its owners come from a wide range of backgrounds. 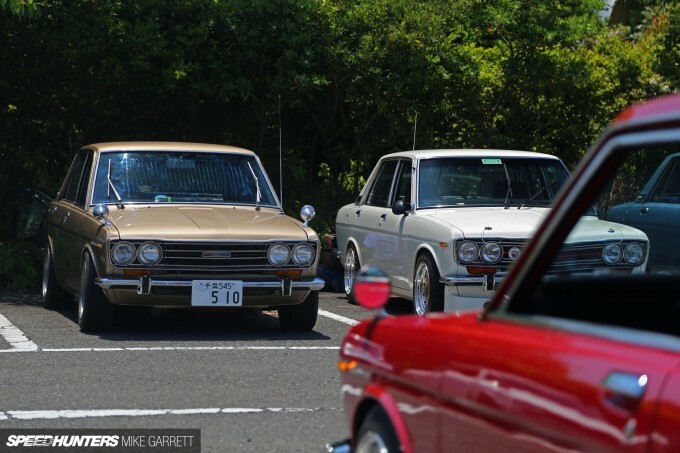 Some are restorers, some are weekend racers, and some just like to cruise. 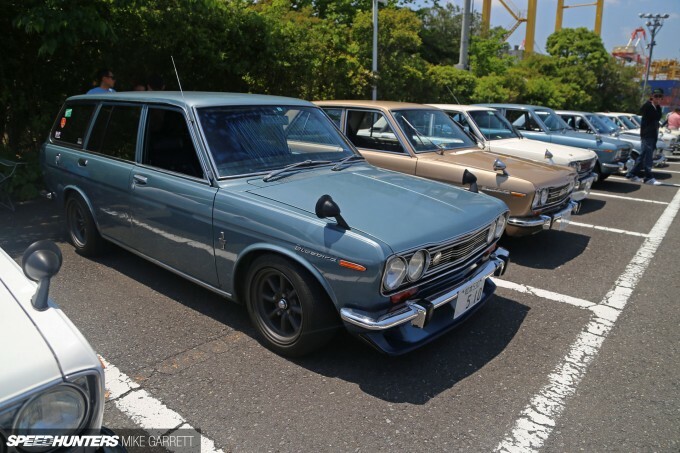 The 510 was immensely popular overseas, and it’s quite common to see 510s in Japan that have been modified in a distinctively American style. 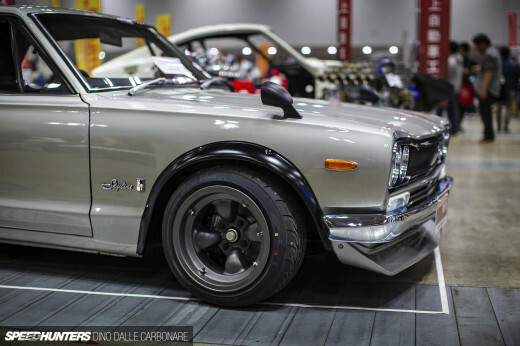 We’re talking stuff like door mirrors, fender flares, Libre wheels and BRE chin spoilers. 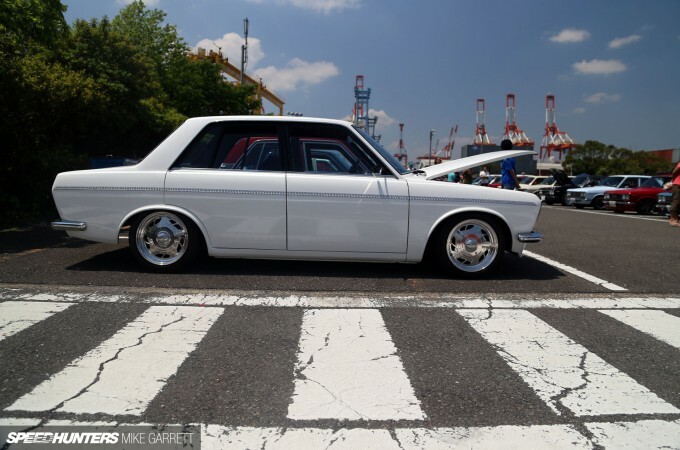 This sedan is a perfect example of an a vintage American-style 510: BRE spoiler, polished slot mags and Cooper white letter tires. It’s USDM style from a time before it was even a thing. 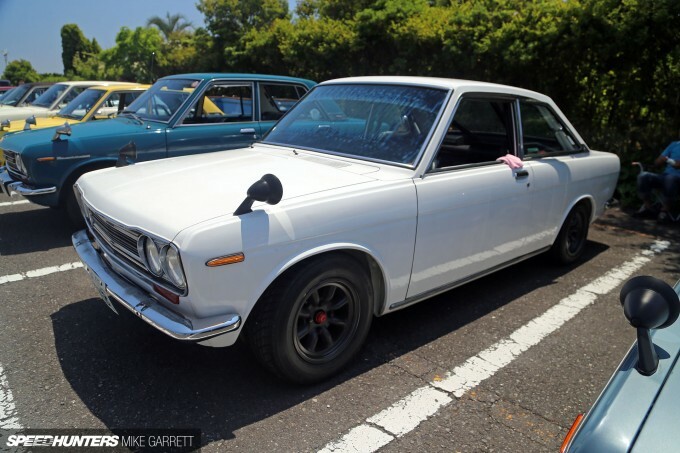 This sedan on the other hand was modified in a more homegrown Japanese way. 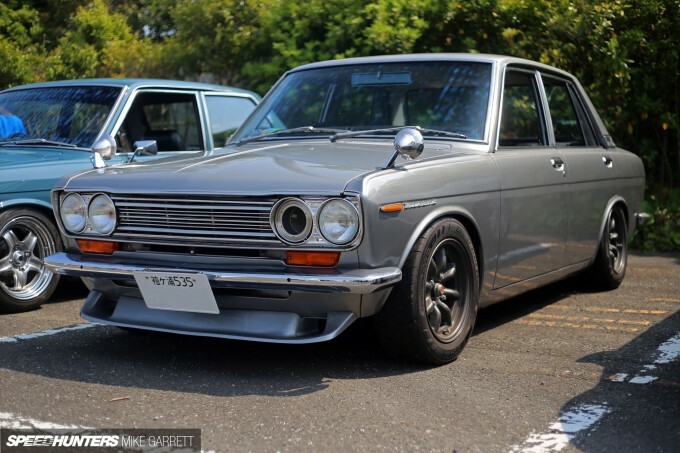 Check out the RS Watanabe wheels with Advan Neova rubber, fender mirrors and the air intake in the headlight hole. I think I love both styles in equal amounts. 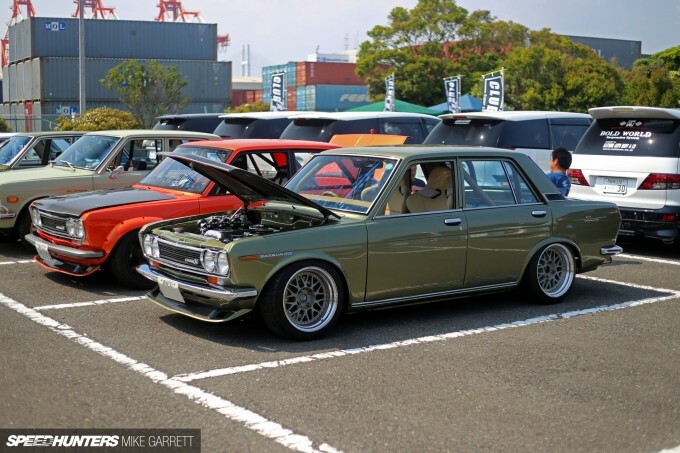 Another cool thing about the 510 is its wide variety of body styles. 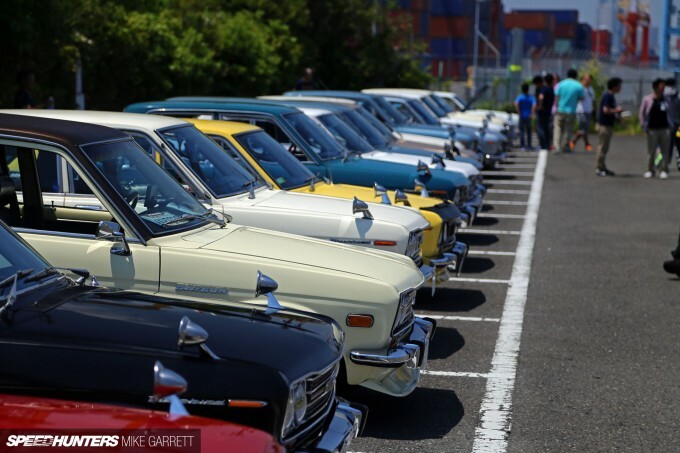 All of the different shapes were present and accounted for in Yokohama on Sunday. 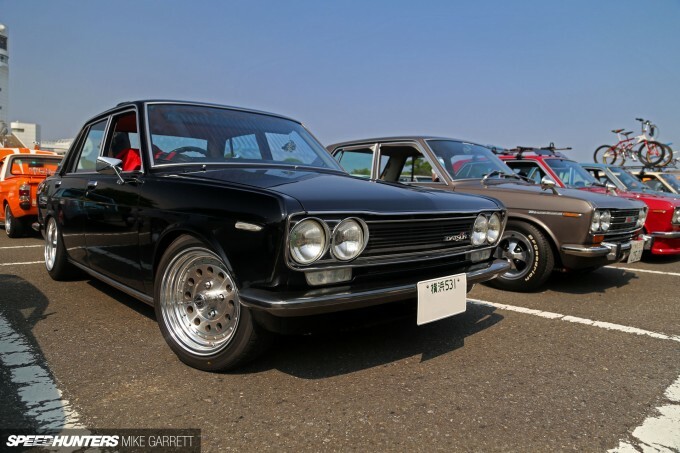 There’s the two-door sedan – a body type that’s especially popular among those going for a US-inspired look. 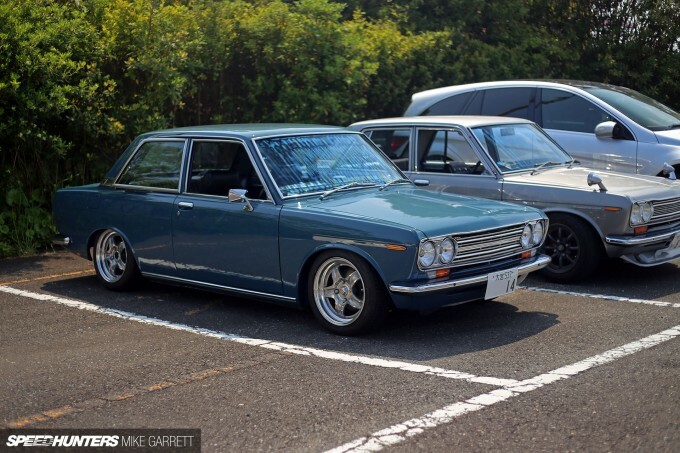 Then there’s the four-door sedan, which seems to be the most popular body style among Japanese-market Bluebirds. 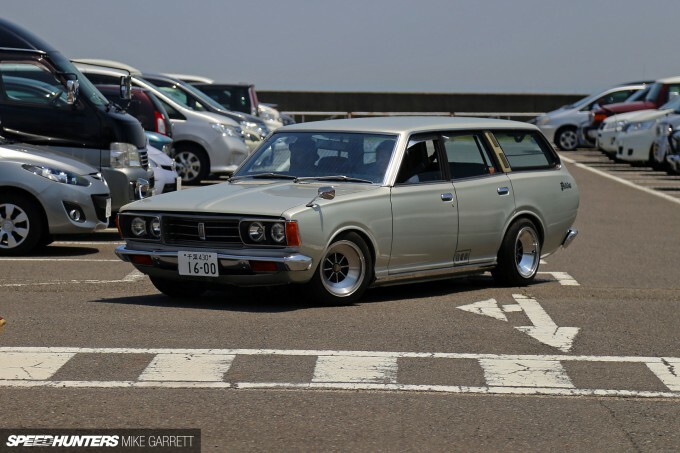 Then there’s the station wagon. 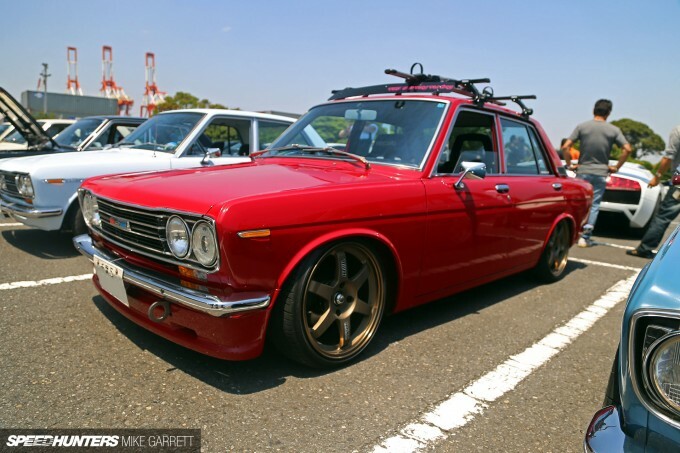 And what’s not to like about a 510 that has extra room for all your stuff? 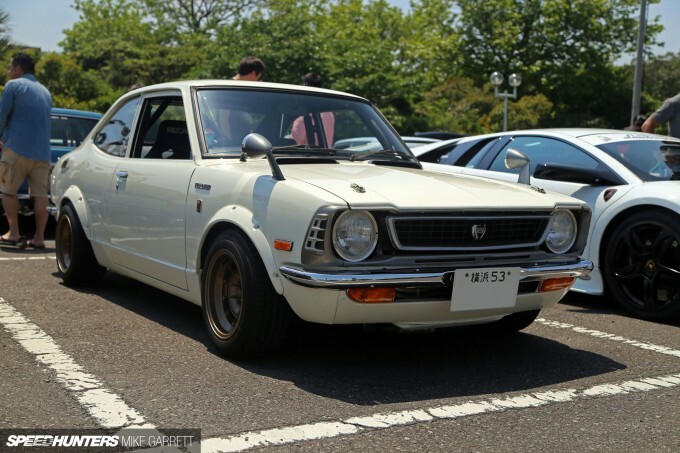 Last but certainly not least is the two-door coupe with its unique roofline and straight-across tail lamps. Man, it’s hard to pick a favorite from this group! 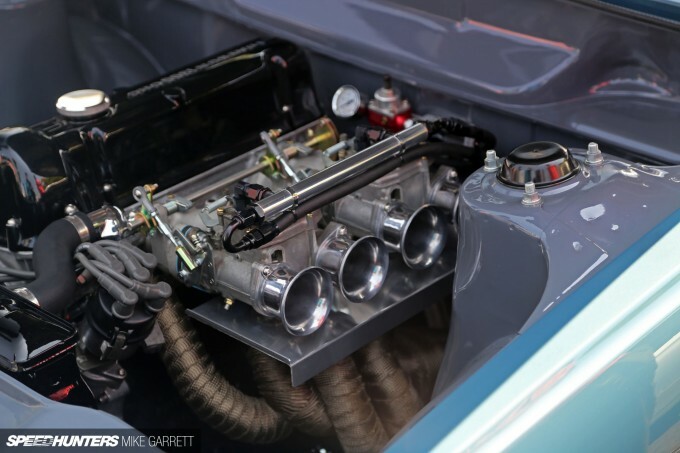 The modifications made to the cars also spanned a wide spectrum, with some owners preferring period-correct setups with built L-motors and vintage wheels. 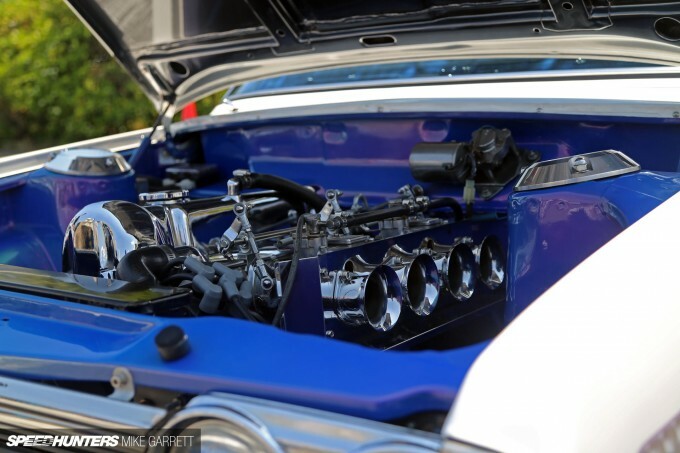 A couple of the cars were taken far beyond your typical resto-mod job. 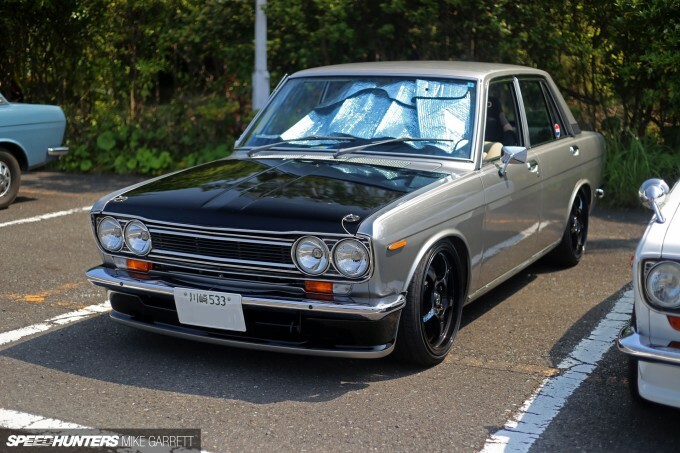 For example, Hosokawa-san’s fully-built 510 is packing turbo SR20 power and a bunch of trick suspension work. 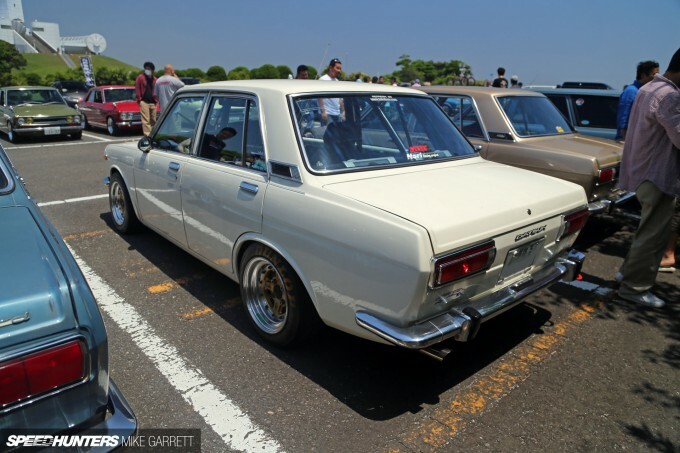 You might recognize Hirano-san’s stunningly clean, naturally aspirated SR20 sedan from my recent Wekfest Japan coverage. Look out for full features on both this car and the turbo machine in the future. 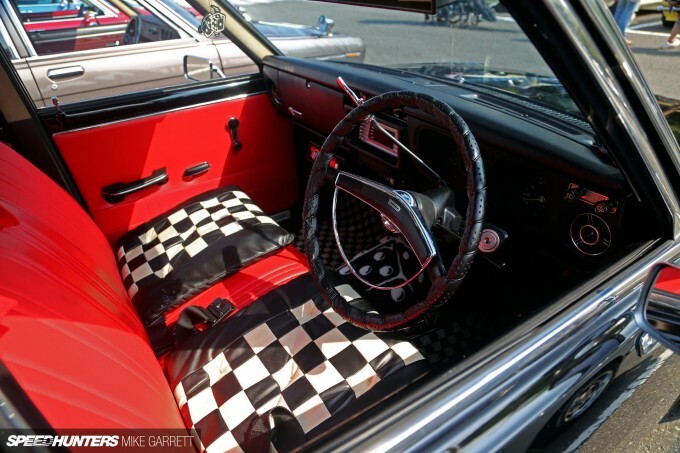 Or a bench seat and a column shift automatic for some old fashioned cruisin’ style? Do it your way. 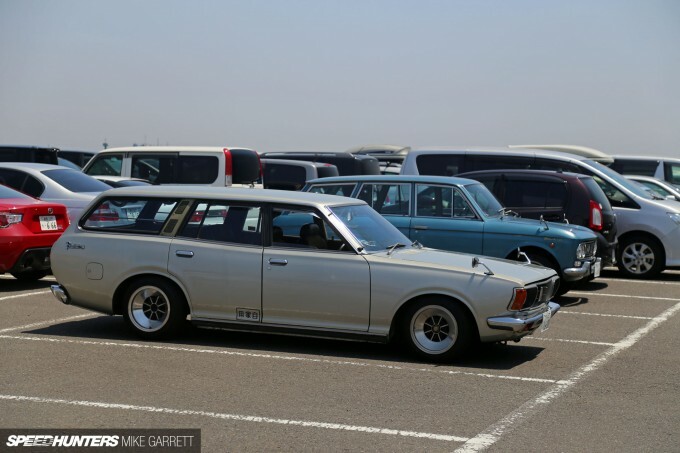 While the meet was officially for 510s, there were plenty of other cool vintage Japanese machines that came to check out the festivities, including this rare Bluebird U Wagon lowered over a set of Drag Fortran wheels. 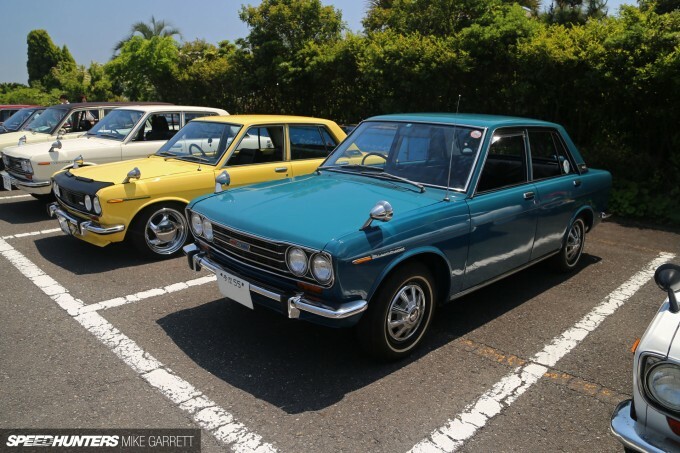 It might not be as recognizable as its older counterpart, but the 610 Bluebird Coupe is equally cool – especially when its dropped down on a set of Hayashi Streets like this one is. The SoCal-inspired look of this Sunny Truck was a perfect fit with the ocean breeze blowing across the park. All it really needs is a couple of surfboards in the back! I was quite pleased to see this C30 Laurel out there as well. 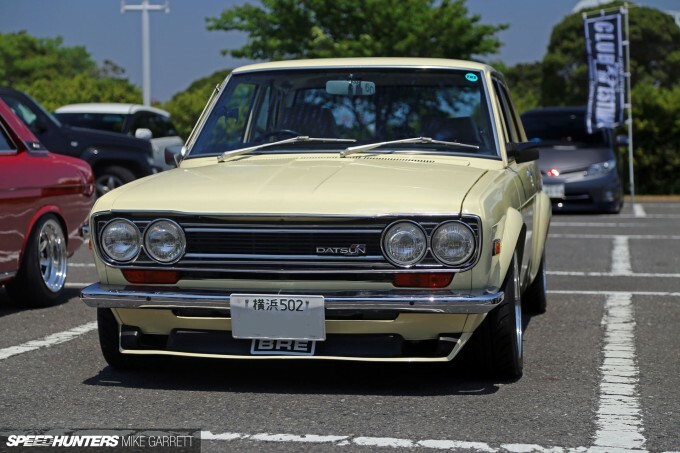 The later C130 models always get a lot of love, but it’s not often you see a first generation car like this one. 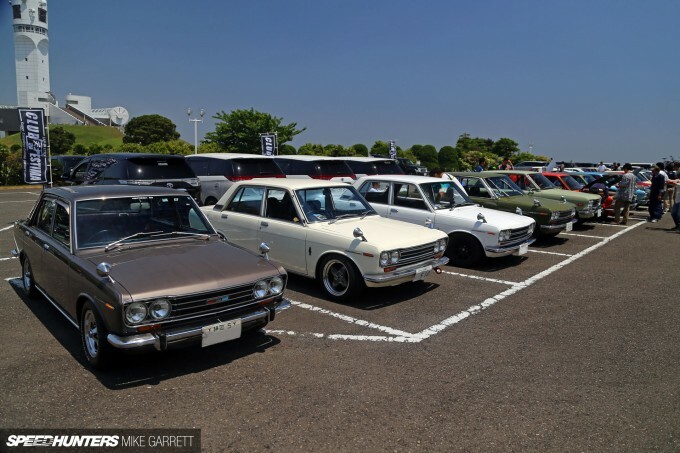 Hey, who let the Toyota into the Nissan party? 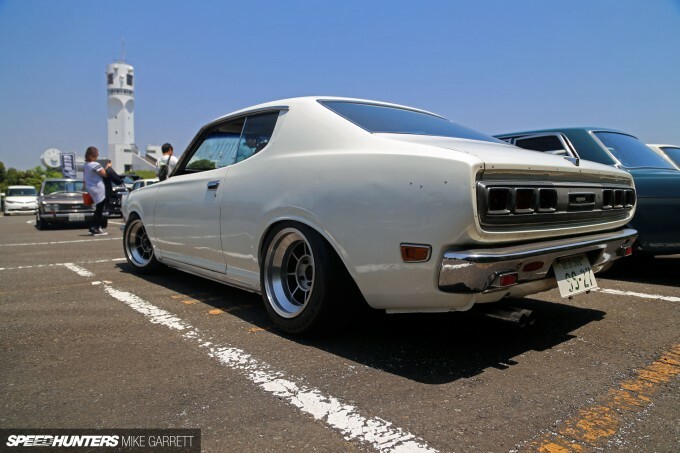 No complaints on my end, as this Tosco wheel equipped TE27 Levin was an absolute masterpiece. 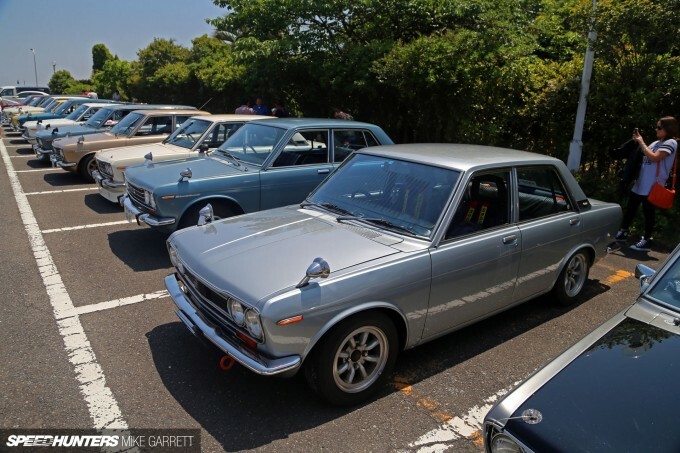 The Yokohama 510 Day meet certainly wasn’t the largest event from my current Japan trip, but the beauty of this place is that even the casual gatherings are absolutely great. 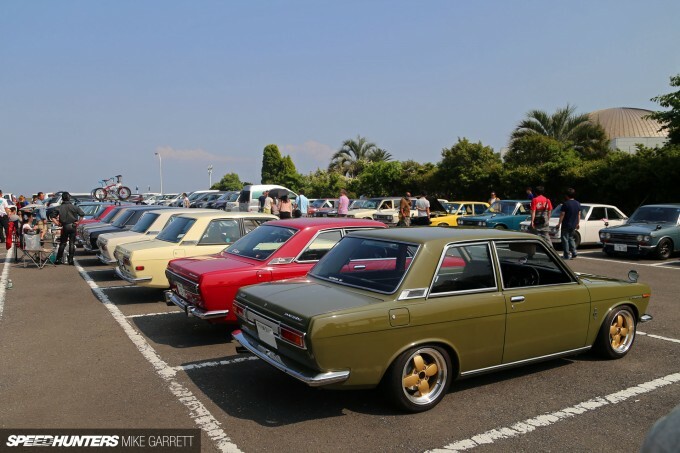 Great cars, perfect weather and a beautiful setting – not a bad way to spend another lazy Sunday afternoon in Japan! 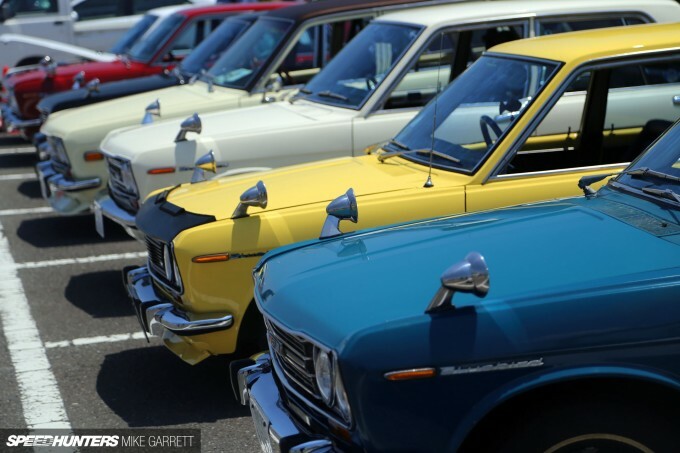 Datsuns are everywhere here in Sydney. The 1200 as we call it has had so many different styles over the years, it's hard to find one that hits you in the face as different enough from the others. 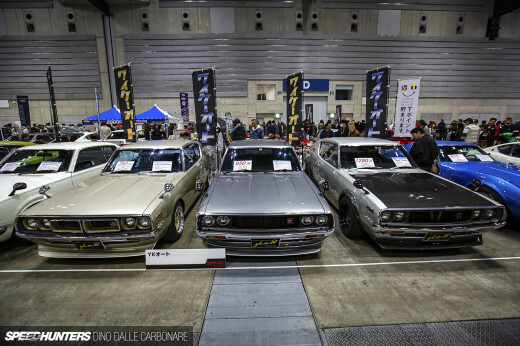 But then I see the Japanese ways and think there's so many more styles we haven't had here. Way to keep the dattos going strong! 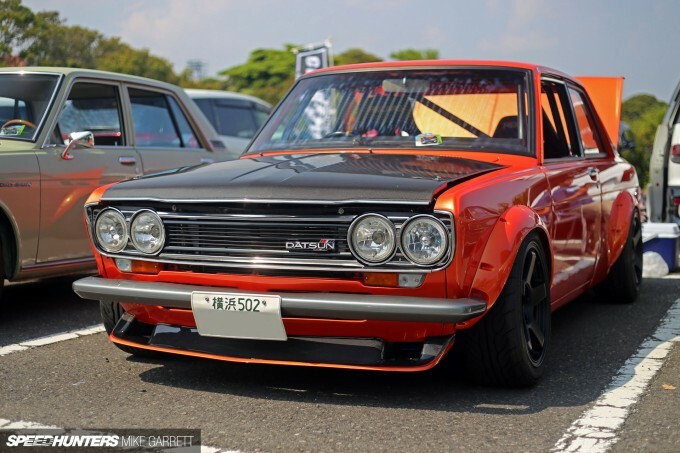 Damn it, now I want a Datto 1200/510. @510Malaysia nice turn out too! Loving the Kuwahara BMX bikes! I've always wanted one these. Such a neat little car. I would love to do a Trans-Am replica. 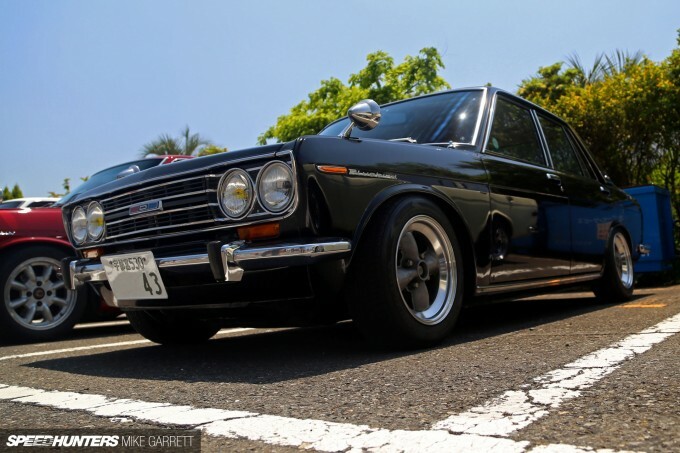 I love 510, especially two-door sedan. A little sheepish question here, but was the Sunny Truck available in a long wheel base and a short wheel base? I did a double take on the blue example, as it looks longer than the type found here in South Africa, the Nissan LDV was built new until 2008, with a 1400 motor. 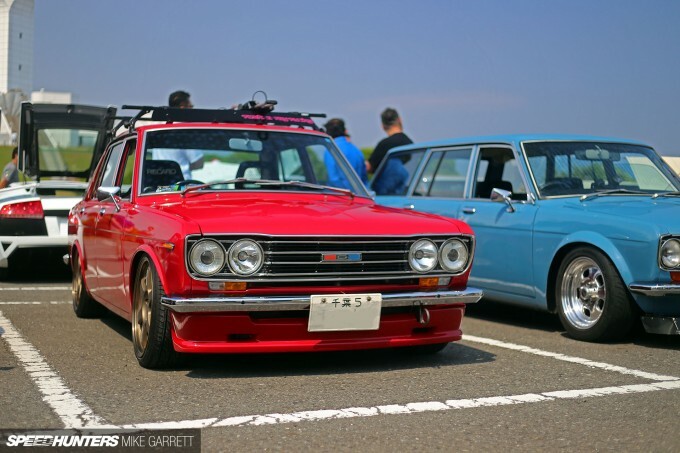 These are super popular for 13B and SR swaps because of the RWD layout. HunterHunted Yes, there was a long wheel base version. 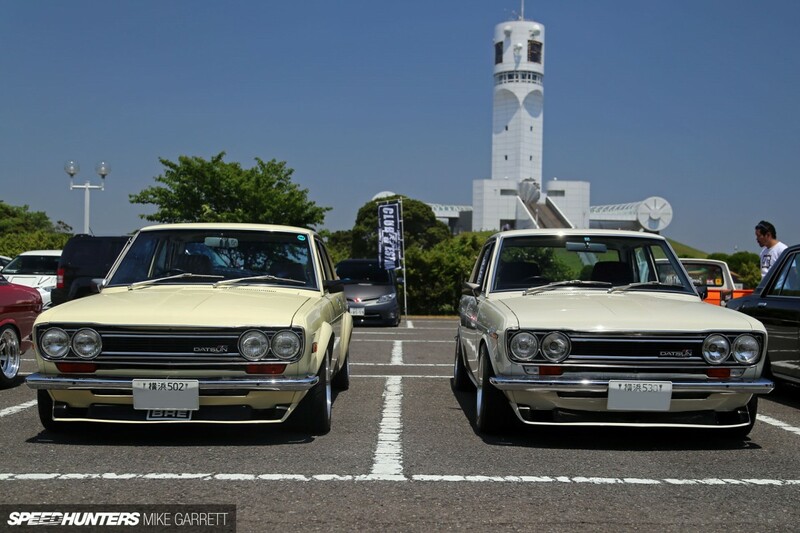 I don't think they were ever exported on mass or manufactured outside of Japan.